Expressing Palate » Edible Spice Book! You Are Here: Home » Gadgets & Tech » Edible Spice Book! 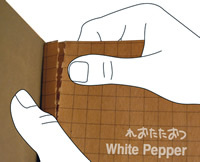 The MUJI taste-leaf book, is a food spice solution, with each perforated page embedded with a spice. Pages are removed from the book and added to the dish as required, where in moisture and heat, the page structure will dissolve, leaving just the fragrant spices to add colour and flavour to the food. 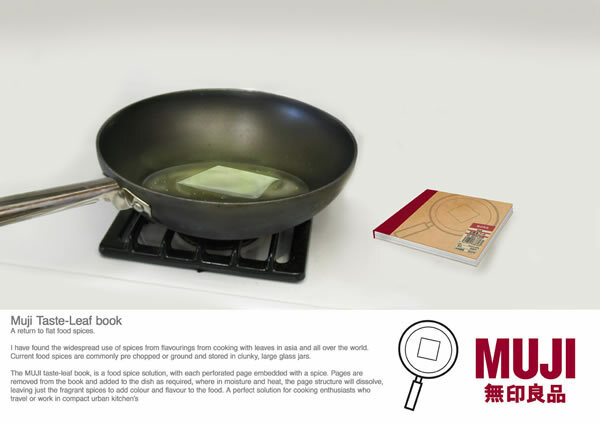 MUJI is answer to the needs of the cooking enthusiasts who travel or low on kitchen storage space. What are the procedures in making these innovation. Do we use rice paper here to embedded the flavors? Do I still need to extract essences of the spice? Do I need to powederize spices? How do I bind the spices? I am hoping for a reply thanks. ..Or rather can you please give me a website in which I will find the general procedures to make this. I need this badly for my feasibility study. Thanks.